This all in one design is perfect for the little scholars in your life. 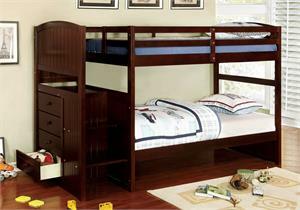 The loft bed combines the best parts of an entire bedroom set into a single cohesive bunk bed. Open shelving on one side is perfect for books or a lamp for spooky nights. The built in desk has drawers for school supplies and a tack board panel to put stick note reminders.